Richmond is a city in California, located in the Contra Costa County. The city was just incorporated on the August of 1905. Richmond lies on the eastern region of San Francisco Bay Area and shares the border with many other cities. The city has a population of 103,710 and is ranked the 61st populous city in California. The city has enough benefits to keep its locals and visitors comfortable, and one of these benefits comes through the services of the widely located emergency dental clinics they have in their area. Imagine that it is the middle of the night and everyone is fast asleep. You have an important meeting in the afternoon and have to look proper and well rested. But suddenly, you wake up and are dazzled as to what broke your sound sleep. Then you notice pain around your left jaw and go to check it out in the mirror- you find out that your gums are bleeding. What do you do at this point? Gargling isn’t helping because you have avoided going to your dentist for this for too long. At this point, your only savior is the emergency dentist a few blocks from your building. 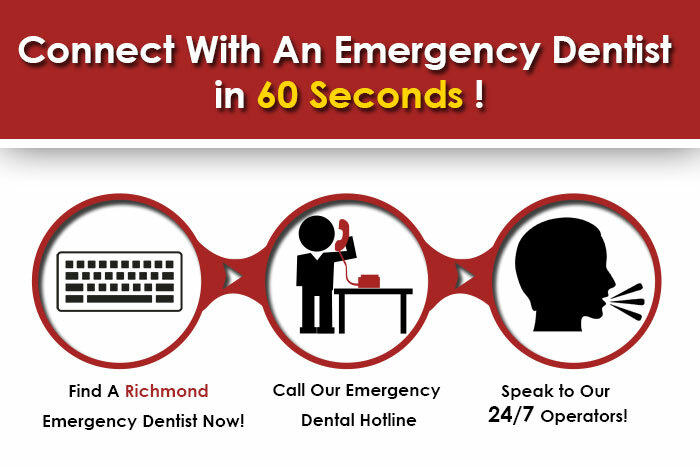 Yes, emergency dental centers are widely located all over the city of Richmond, and yes you can trust them. So jump off the bed, and pick up that phone to set up an immediate appointment with your savior. In Richmond Dentals, the doctors are highly trained in not only treating your teeth, but also intreating you altogether. If you are an emergency patient, you will be immediately dealt with. The staff is highly trained to give you proper examination and tests to help determine the root of your problem and then give you the required treatment. So, sit back and relax because when you are in their hands you are perfectly safe. Call (510)233-6515 or visit on 265 16th Street, Richmond, California across from the Richmond Bart Station. Hilltop Family Dental is the one-stop solution for all your family members’ problems. They can handle gum disease, dental implants, laser dentistry, dentures, dental bridges, etc. They will give you longer lasting, higher functioning, and better looking results. They can deal with all dental emergencies to give you your beautiful smile back. Call at 510-758-7222 or visit their clinic at 2970 Hilltop Mall Rd. Suite 211, Richmond, CA 94806. Whether you have toothache, chipped teeth, knocked out teeth, missing fillings, or missing restoration (that is, completely lost the filling or crown), the doctors in Wong & Wong are qualified to help you with anything. As long as its an oral problem, they can solve all whether it is an emergency or not. But you will, of course, be given greater priority according to the type of problem that you are having. So don’t hesitate to call them at +1510-669-0350 in your time of emergency and get an appointment!